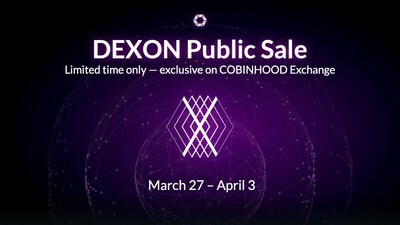 NEW YORK, March 27, 2019 /PRNewswire/ -- DEXON, an innovative blockchain technology as the ultimate solution for real-world, industry-level decentralized applications (DApps), hosts the public sale of its native currency, DXN coins, from March 27 to April 3 exclusively on COBINHOOD's Coin Offering Platform. Open to investors with a hard cap of 15 million DXN coins, the public sale will be a key milestone before DEXON's mainnet launch in the second quarter of 2019. Unlike popular blockchain systems hamstrung by high latency, security threats, or mining centralization issues, DEXON solves the infamous blockchain trilemma of decentralization, security, and scalability to accelerate the mass adoption of this technology. Through cutting-edge protocols including fair cryptographic sortition, partition-resilient and responsive Byzantine agreement, DEXON provides a high-performing and reliable infrastructure for DApps that can be applied across various industries, including IoT, smart payments, gaming, music, and assets exchange services. "We are humbled by the great support and interest shown by various stakeholders over the course of the year about DEXON. As our team prepares to release the DEXON mainnet, this public sale's primary purpose, rather than fundraising, is to allow our supporters to become active contributors to the network's growth. It is a mutual testament between our team and our supporters' commitment to expanding the DEXON ecosystem, and we invite everyone to participate in this sale to enjoy, first-hand, DEXON and its products and features to be rolled out in the coming months," said Popo Chen, co-founder of both COBINHOOD and the non-profit DEXON Foundation. The total supply of DXN coins sits at 4 billion. The genesis supply is 1 billion DXN (25% of the total coin supply), while the other 3 billion DXN will serve as mining rewards (75% of the total supply) after the DEXON mainnet launch. Due to laws and regulations in applicable jurisdictions, the public sale is not available for citizens and residents of Canada, Cuba, Democratic People's Republic of Korea, Iran, Japan, Malaysia, Myanmar, Syria, Sudan, and USA. DEXON released the testnet in November 2018 and has reached 12,000 TPS with fast finality of 1 second, already surpassing current blockchain systems. The DEXON mainnet is set for launch in the second quarter of 2019, aimed at fostering a comprehensive blockchain ecosystem relevant for daily uses.